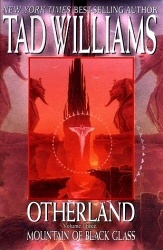 This is the third book in the Otherland quartet and it’s much of a muchness with its two predecessors. The story continues, the main characters move to different simulated worlds within the Otherland network – and all converge on one particular simworld. The storytelling seems to have slowed down a little from the first two volumes – Paul Jonas, for example, only spends almost all his time in this book in the simulation he found himself in at the end of book two. The climax of the story depends on the psycho killer Dread – but he is absent from that climax as a viewpoint character. The basic premise becomes a little more ridiculous as the villains of the piece, the Grail Brotherhood, move towards attaining their goal. Paul watched [the stars] pass through their slow dance above his head, so close it seemed he could reach up to them and freeze his fingers against their cold light, and vowed that if he ever found his way home he would never take the heavens for granted again. I still enjoyed it though, still going to read book four.